This finish I'm sharing with you today was actually finished quite a while ago and has been living in its new home, but with the craziness of the inter-state move, I am just now getting around to posting it. Some of you may remember this post where I asked help for making a quilt for one of my husband's coworkers who had a lot of terrible stuff happen in the previous year. 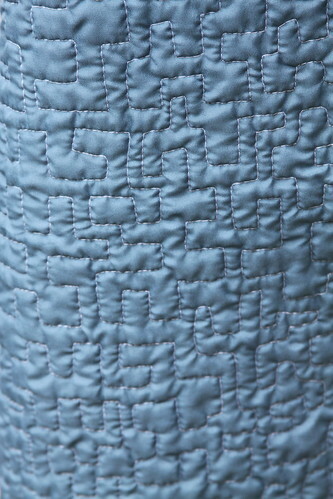 Many lovely ladies donated their time and scraps to making blocks for this quilt. It took a bit longer than hoped to get all the necessary blocks, but I did get the quilt together in the beginning of this year. 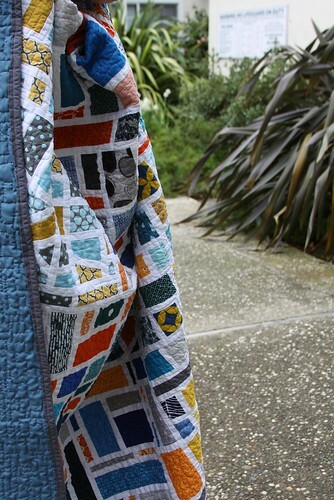 This quilt was made using the Mod Mosaic pattern from Elizabeth Hartman, available for free on her blog, Oh Fransson!. This pattern is simple enough, but very time consuming. I had to make 9 blocks myself, and each block took over an hour easily. I had to get a bit creative with the block arrangement to accommodate all of the different interpretations of orange. I tried to just go with the different colors and use that in the layout to create "windows" of the different hues rather than just having a few randomly stand out. I quilted it using a sort of boxy stippling, also inspired from Mz. Hartman. 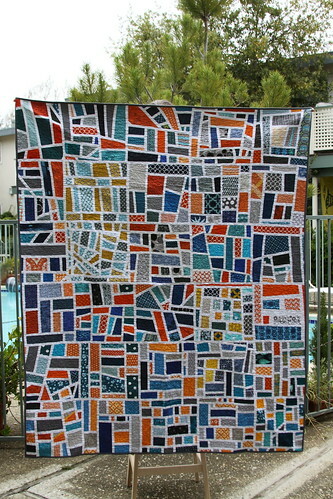 This quilt was made pretty much entirely from scraps from ladies all around the world, and as such I think it appropriate to link up to Rachel's Festival of Scrappiness at Stitched In Color. Whether or not a group quilt qualifies for the competition, I think it is a scrappy quilt to be celebrated for all the work the amazing volunteers put into it. P.S. Linking up at sew & tell. These are time-consuming, you're right. But this is a gorgeous quilt, and your husband's co-worker is going to be so blessed by it. And while it may seem huge for you, it'll probably be just right for him. :) Well done! Thanks so much for coming by and being so supportive! Thanks so much for helping!! It looks great! Thanks for the opportunity to help out. 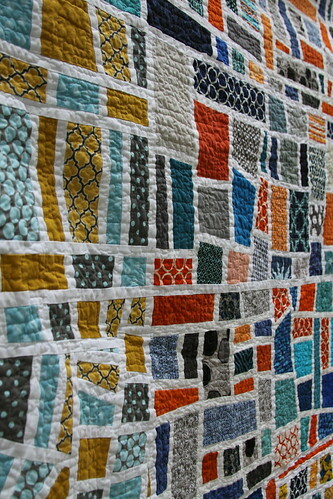 I'm so glad to see this lovely quilt finished. It's gorgeous and it totally qualifies. Good luck!